In The Age of Dignity, thought leader and activist Ai-jen Poo offers a wake-up call about the demographic reality that will affect us all. “We have more senior citizens in America today than we’ve had at any time in our history,” Poo writes, pointing out that more than 14 percent of our population is now over sixty-five; by 2030 that ratio will be one in five. In fact, our fastest-growing demographic is the eighty-five-plus age group—over 5 million people now, a number that is expected to more than double in the next twenty years. This change presents us with a new challenge: how we care for and support quality of life for the unprecedented numbers of older Americans who will need it. 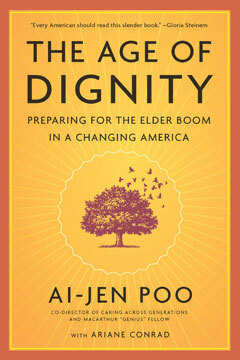 Salon interviews Ai-Jen Poo about caregiving and our nation's attitudes about aging in America. In These Times calls The Age of Dignity a much-needed wake-up call. Ai-jen Poo speaks with All Things Considered about her new book and elder care.